We all want to drive more leads to our conversion funnels. 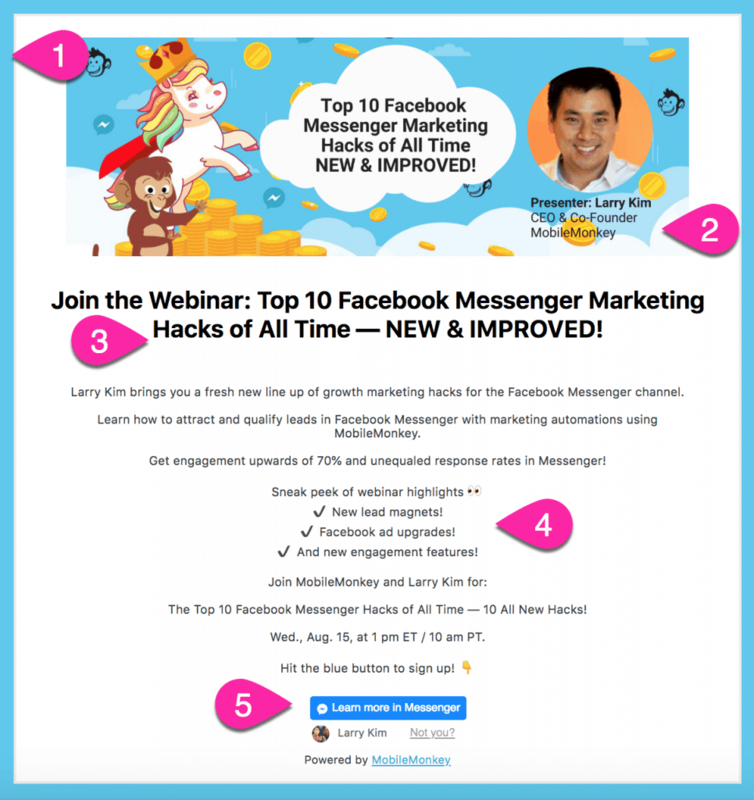 Build landing pages for your offer with the easy MobileMonkey landing page creator and get more upside than traditional landing pages — Facebook Messenger contacts you can message! The possibilities for your landing pages and chatbot conversion funnels are endless, easy to execute and convert more Messenger leads! You don’t have to code anything or wait for someone else to code something next time you need a campaign landing page. You can create landing pages on the fly, as fast as you need them. Those custom landing pages will then direct customers to Facebook Messenger — where you have a chatbot waiting! 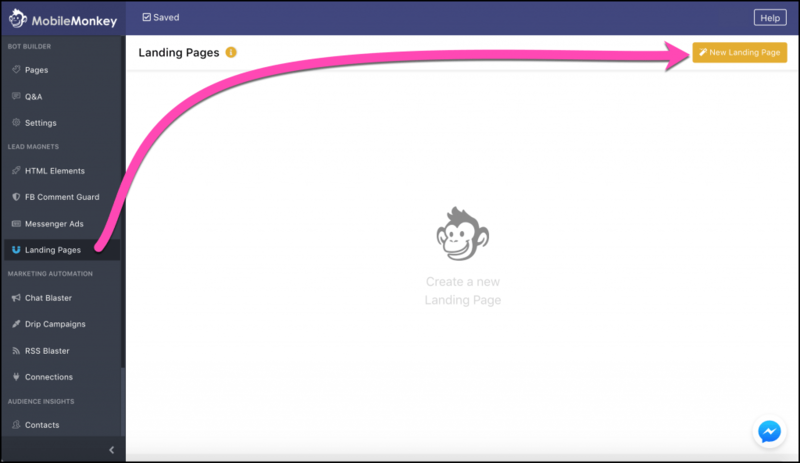 Here’s exactly how you can use MobileMonkey to create a relevant, compelling landing page in minutes. Within “Details” and “Design” you can customize the landing page from text to image, colors to URL to create a completely unique experience for any offer. You’ll be able to tailor each landing page’s header, body content, image, design and URL. We chose a complimentary background color. We uploaded a custom image to display at the top of the page. We optimized the header text. We added relevant, compelling body content. We point to a Facebook Messenger chatbot where the user can sign-up in a mobile-friendly and engaging chatbot experience! Simple, easy and coding-free — and the result is a clean, compelling landing page. See the landing page we created for the webinar here! 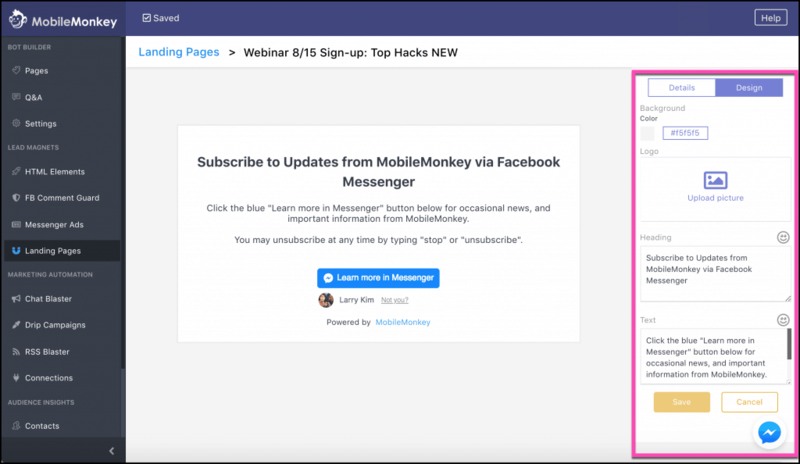 Every landing page you create within MobileMonkey will drive users to a conversation with your business on Facebook Messenger. Increased Facebook Messenger contacts and the ability to connect with those contacts in new and more relevant ways. Landing Page to Facebook Messenger!